CHARLESTON, W.Va. — Within the week, HealthNet Aeromedical Services aircraft across West Virginia will be equipped with new ambulance child restraint kits designed for kids. “Every day, somewhere across our system, we’re transporting critically ill children,” said Clinton Burley, CEO and president of HealthNet. HealthNet is one of six agencies in West Virginia receiving the child ambulance restraints from the West Virginia Office of Emergency Medical Services in collaboration with the West Virginia Healthcare Preparedness Program. In addition to HealthNet, the other agencies are Air Evac, the Anthony Creek Volunteer Fire Department in Greenbrier County, the Logan Emergency Ambulance Service Authority, Cabell County EMS and the Burlington Volunteer Fire Department in Mineral County. “Hopefully, in future years, we’ll be able to purchase more of these child safety restraints and get them to agencies across the state,” said Melissa Raynes, director of the West Virginia Office of Emergency Medical Services. The ambulance child restraints are adjustable to accommodate all kids weighing between four and 99 pounds. “That’s pretty awesome because we’ve had other issues with some of the other restraint devices that just aren’t as good,” explained Thomas Reed, a HealthNet flight paramedic based in Beckley, during a Tuesday demonstration at CAMC Women and Children’s Hospital in Charleston. “We can customize the fit for the individual child that we transported instead of trying, with the old technology, to make the equipment fit the child,” he said. Establishing guidelines for safely transporting children in ambulances has been an endeavor undertaken by various individuals and organizations in recent years. Despite these efforts, this multi-faceted problem has not been easy to solve. While there have been resources developed, such as the Working Group Best-Practice Recommendations for the Safe Transportation of Children in Emergency Ground Ambulances (NHTSA 2012), there remain unanswered questions, primarily due to the lack of ambulance crash testing research specific to children. The National Association of EMS State Officials (NASEMSO) is committed to advocating for the creation of evidence-based standards for safely transporting children by ambulance. Such standards would ensure a safer environment for the patients who rely on the EMS provider to act on their behalf. Developing standards will require large investments of both time and funding to conduct the required crash testing. If research were started today, it would require at least three years and hundreds of thousands of dollars to complete. While NASEMSO collaborates with other organizations to bring these standards to reality, it recognizes the gap between that goal and the reality of the decisions that EMS providers face today will continue to be an issue of concern. The purpose of this interim guidance is to reduce that gap as much and as soon as possible, until evidence can be collected, analyzed, and used to develop standards specifically for children. Ultimately, pediatric restraint devices should be tested by the manufacturer to meet a new, yet-to-be developed standard. NASEMSO recommends that this new standard include a pass/fail injury criteria comparable to that identified in FMVSS-213, which applies to child restraints in passenger vehicles. All testing should use the ambulance-specific crash pulses described in SAE J3044, SAE J2956, and SAE J2917 respectively. Litters used in testing should meet the SAE J3027 Integrity, Retention and Patient Restraint Specifications. Lakeview Hospital Emergency Medical Services now offers a new way to transport pediatric patients. Lakeview Hospital Emergency Medical Services (EMS) with help from the Lakeview Health Foundation purchased Quantum Ambulance Child Restraints (ACR) for their ambulances to transport children in a safer manner. On average Lakeview EMS has over 6,000 requests for service and serves over 100,000 people in a 325 square mile radius. The Quantum ACR is for newborns and children ranging in weight from 4-99 pounds. It is compatible with any cot, has breathable fabric, which maximizes airflow and meets infection control standards. It also allows rapid transition from sitting to flat in an emergency or to recovery position and much more. Previous to this technology, newborns and children would be transported in a car seat or on the adult sized stretcher. SPRINGFIELD, Mo. --The threat of injuries doesn't necessarily stop once a pediatric patient is in the ambulance. Medical experts have come to realize that because a significant number of ambulance crashes occur each year and about a thousand of those involve pediatric patients nationwide. Martin explains the Ambulance Child Restraint, or ACR ,will accommodate children between four and 99 pounds. All 55 ambulance vehicles have been equipped with this new safety restraint. Martin tells us the only other Missouri hospital with these new restraints is in Warrensburg. CoxHealth is in the process of getting these new Ambulance Child Restraints on their helicopters sometime in the near future. LAKE SUCCESS, NY—Quantum EMS Solutions is pleased to announce the launch of its new product, the ACR-4, a full-range ambulance child restraint system for the U.S. market. The ACR-4 (ambulance child restraint) is the latest version of the original ACR; however, ACR-4 now allows for the safe restraint of all children from 4 pounds–99 pounds during transport. The ACR-4 is an innovative, flexible and fully-adjustable harnessing system designed for the safe and effective transport of infants and children in an ambulance, and it is color coded for easy selection. Universal cot straps (included) connect with the ACR harness, holding the patient in place to prevent potentially dangerous movement during transportation. The ability to perform procedures while the child is restrained. ACR has an open channel design from the airway to the waist. The restraint tightens into the mattress of the cot, not the patient. Fits on any cot without a bracket adapter. Can be used in sitting or supine position. One restraint system to service all patients. LAKE SUCCESS, NY, December 1, 2014 – Quantum EMS, is pleased to announce that the Wyoming Emergency Medical Services for Children Program (EMSC)has purchased 103 Ambulance Child Restraint (ACR) Systems as part of its overall pediatric safety project for EMS allowing for the safe and effective restraint of pediatric patients transported in Wyoming between 11-99 pounds. “The Wyoming Department of Health and our partners in this project are committed to the safety of Wyoming’s children. We hope they never have to ride in an ambulance, but if they do, we want to ensure that our EMS crews have the tools they need to safely transport them,” says Brandon Kelley, EMSC program manager, Office of EMS, Wyoming Department of Health. The Wyoming EMS for Children program serves the entire state of Wyoming, striving to ensure that EMS providers are educated and up to date on the latest treatment standards and developments in pediatric healthcare. The EMSC program serves over 80 EMS agencies and hospitals throughout Wyoming. The ACR (Ambulance Child Restraint) is an innovative, flexible and fully adjustable harnessing system for the safe and effective transport of infants and children in an ambulance, and is color coded for easy selection in three sizes from 11 to 99 pounds. Quick release clips dock with the ACR harness, holding the patient in place to prevent potentially dangerous movement during transportation. Quantum EMS, is pleased to announce the launch of the “ACR On Board for Child Safety Program”. Details regarding the program can be obtained by contacting Quantum EMS directly at 516-321-9494 or by visiting www.quantum-ems.com. From new stair chairs to a bag that lights up, EMS Today showcased a range of exciting new products. Touring the exhibits at February’s EMS Today conference in Washington D.C., I was impressed by the quality of the education sessions, the combination of EMS clinicians, administrators and educators in the hall, and some great new EMS products — many of which were introduced for the very first time. Quantum EMS introduced two new stair chairs to EMS. One, the Swiftlite Q-110, is one of the lightest and least expensive folding tracked stair chairs. It handles up to 400 pounds and can be operated by one person in an emergency evacuation. The other, the Swiftlight Q-120, is built like a steel tank with intuitive controls and ergonomic handles. Yes, it is a little heavier and more expensive, but it is clearly designed to last for years under hard use. The engineering is elegant simplicity and the materials of construction are second to none. LAKE SUCCESS, NY—Quantum EMS is pleased to announce the launch of its new product, the Quantum Swiftlite Q-100 stair chair. Lightweight and durable, the Q-100 chair weighs only 16 pounds and has a payload capacity of 440 pounds. The chairs comes complete with restraints and wall mounting bracket. Details regarding the products can be obtained by contacting Quantum EMS directly at 516/321-9494 or by visiting www.quantum-ems.com. Quantum EMS, based in Lake Success, NY, is an emerging medical device company that sells multiple medical devices specifically for the EMS market. Our products serve the immobilization, patient transport and first aid categories. 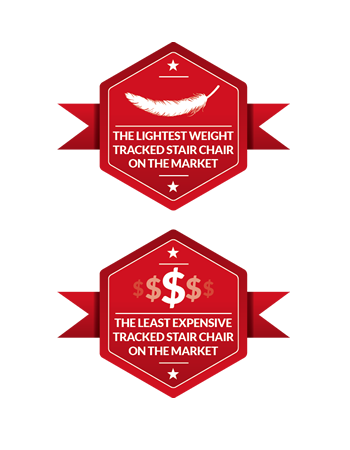 LAKE SUCCESS, NY—Quantum EMS is pleased to announce the launch of the lightest weight and least expensive track stair chair in the U.S. market. The Swiftlite Q-110 is now available through Quantum’s North American distributors. The QUANTUM Swiftlite Q-110 is a modified Q-100 single-person operation stair chair incorporating two carry-handles that allows for two person operation, including upwards transport. Bordnick added, “The Swiftlite is one of three stair chairs we will be offering the U.S. market. The Swiftlite 100 is an untracked carry chair and the Swiftlite 120 is a stair chair that has the capability to both ascend and descend stairs. The 110 and the 100 offer the same lightweight, sleek, slim, durable design and inexpensive price point that is characteristic of our product line. We just launched the product into the U.S. market and one of our distributor sales representatives, Henry Schein EMS’s Alan Espinosa, received the first United States order from Alpharetta Fire Department in Alpharetta, GA, a prominent fire department in metropolitan Atlanta. Quantum EMS, based in Lake Success, NY, is an emerging medical device company that sells the multiple medical devices specifically to the EMS market. Our products serve the immobilization, patient transport and first aid categories. LAKE SUCCESS, NY, January 10, 2014 – Quantum EMS, is pleased to announce the launch of its new product ACR- The Ambulance Child Restraint System for the US Market. The ACR is now available to through Quantum’s North American Distributors within in the US Market. ACR (Ambulance Child Restraint) is an innovative, flexible and fully adjustable harnessing system for the safe and effective transport of infants and children in an ambulance, and is color coded for easy selection in 3 sizes from 11 to 99 pounds. Quick release clips dock with the ACR harness, holding the patient in place to prevent potentially dangerous movement during transportation. Kris Bordnick, Vice-President of EMS Sales North America, issued the following statement in regard to the announcement – “The ACR provides a safe, innovative,cost-effective, solution that allows EMS Providers to safely restrain a full range of pediatric patients”. “One size does not fit all when it comes to restraining pediatric patients”. Bordnick also added, ““According to www.saferidenews.com Approximately 620,000 children per year ride in ambulances while improperly restrained.” While multiple factors contribute to this number, the ACR product when properly utilized will assist in reducing that number due to the fact due to it’s flexibility and allow for a broader renage of pediatric patients to be restrained correctly. Quantum EMS , based in Lake Success , NY is an emerging medical device company that sells the multiple medical devices specifically to the EMS Market. Our products serve the immobilization, patient transport, and first aid categories.